While the phrase “most murderous mammal” may bring to mind the lion, the tiger, the bear, or of course the human being, the animal that in fact holds that distinction is none other than the meerkat. According to a new report published in Nature, the meerkat, more than any of the 1,024 mammals in contention, is most prone to intraspecies killing. This may come as a surprise to those who know these small African creatures from the adorable inroads they’ve made into internet culture in the past decade or so. 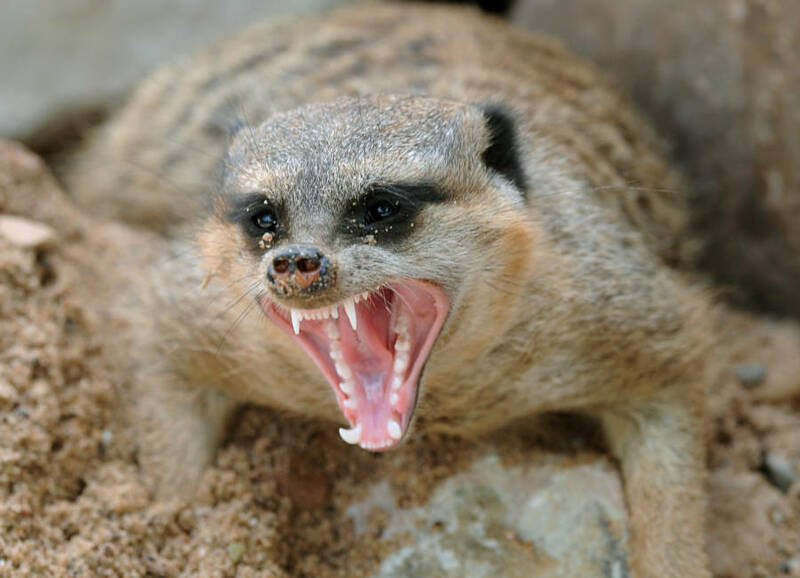 Nevertheless, the University of Granada researchers behind the new study determined that just about one in five meerkat deaths comes at the murderous hand of another meerkat. And why exactly are meerkats, more than any of these other creatures, so murderous? The Spanish university researchers concluded that adult meerkats often kill their young in order to conserve resources and kill each other in order to preserve the rigid hierarchies of their society, in which only some have mating rights and offspring of subordinate members are killed to make room for those of a more dominant member. Such striking findings aside, the researchers actually set out to trace the biological roots of human violence in comparison to other species. And on that front, the results might not be quite what you’d expect. 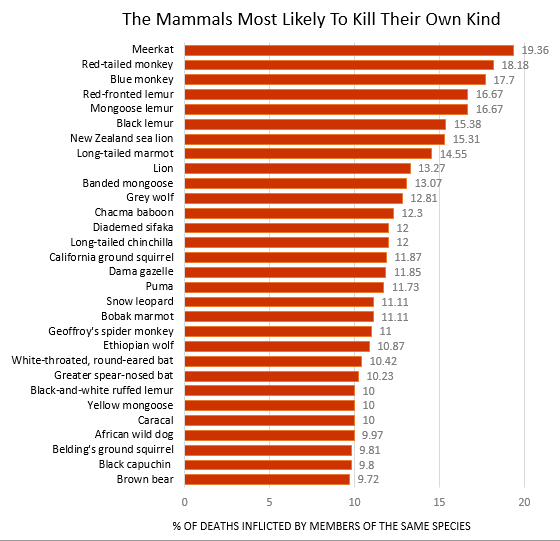 For example, you’ll note on the chart above that humans aren’t among the top 30 most murderous mammals. In fact, modern humans are far from it, with just 0.01 percent of our deaths caused by homicide. In hopes of uncovering humankind’s innate inclination toward murder, researchers attempted to strip away the environmental factors (norms, laws, police forces) that separate humans from other mammals. Thus, the researchers tracked the human homicide rate of its early hunter-gatherer phase, before environmental deterrents to murder really existed. And in that phase, the share of human deaths caused by homicide was two percent. That number — the more reliable one when comparing us to other species — puts humans well behind the leaders above, as well as humanity’s evolutionary ancestors (apes come in at 2.3 percent of all deaths), but well above the mammalian average: 0.3 percent. However, the human homicide rate has spiked to extraordinary levels at certain times in human history, even reaching 12 percent of all deaths during the Middle Ages. So, even if humankind is still above the mammalian average, perhaps us Homo sapiens can take some comfort in knowing that our bloodiest days seem to be behind us. 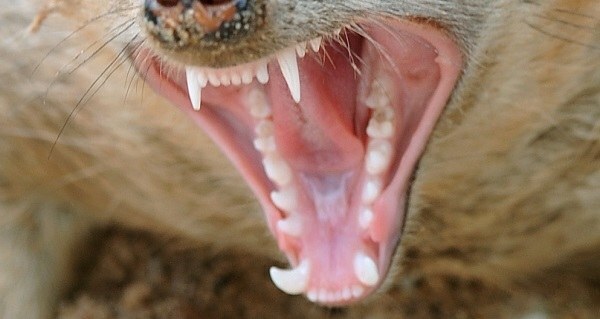 Next, read up on the bizarre eating competitions that meerkats hold in order to determine mating rights.